McKelvie is a master of eye-popping visuals. Midway through the opening volume of “The Wicked + The Divine”, the series’ protagonist has a knock down, drag out argument with her parents. Artist Jamie McKelvie’s crisp pencils depict the acrimony as teenager Laura irrationally hollers at her mother and father before storming up to her bedroom. In one panel McKelvie offers a closeup of the enraged young woman, out of control and spewing venomous indignation towards her parents. But writer Kieron Gillen shares none of Laura’s venom. Rather, the scene is recounted in first person and briefly breaks the fourth wall at one point as Laura admits, “I wish you hadn’t seen this.” At this point, and at similar points in “The Wicked + The Divine, Vol. 01: The Faust Act”, the book brushes up to perfection. Unfortunately, perfection is a hard thing to maintain. Twelve gods have recently been reincarnated as “The Wicked + The Divine” opens. They are known as the Pantheon and they have inhabited the bodies of various English youngsters, aged between twelve and seventeen or so. Most of the Pantheon, if not all, have chosen to become musical performers, whether pop stars or playing to underground audiences. Regardless the genre, the Pantheon have bewitched the youth of England with their unparalleled performances. We only see one of the Pantheon performing in the opening chapter, in a spectacularly effective scene, but it ends there. This is problematic for the rest of the book because there isn’t a substantive amount of context for the excitement Laura and the rest of the country have for these new celebrities. Sure, we are made to understand that the Pantheon is supposed to be the be-all-end-all, but we barely get a peak into the world of their celebrity and it leaves the story feeling partially disconnected. The book could benefit from some additional scenes featuring the Pantheon as pop wunderkinds or, at the very least, a montage. The next problem for “The Wicked + The Divine” is that it utilizes a bland protagonist to explore Gillen and McKelvie’s heavenly new world. Laura is a starstruck teenager who is either confessing her love for the Pantheon or trying to solve the murder mystery at the center of the story. There is nothing more to her than that, which is unfortunate because she is in every scene and there is little done by Gillen to flesh her out into something interesting. On the other hand, Lucifer, a seventeen year old blond girl, is one of the most fascinating characters. Lucifer is the most wicked in “The Wicked + The Divine” and she is both effectively and sparingly used. One of the book’s oddities is that Laura has unprecedented access to these impossibly fast-rising superstars. She has little problem getting close to the Pantheon, whether at a concert, or when one of them is involved in a high profile court case, or she’s invited into their inner sanctum. Laura only receives quasi-celebrity status at the end of the book, even though she continues to be caught in the middle of Pantheon-related events that would have undoubtedly been covered by a swarm of international press. McKelvie and Wilson’s imagery is nothing short of stunning. All of these criticisms aside, Gillen works many charming and unexpected storytelling techniques into “The Wicked + The Divine” that make the book, at times, irresistible. In one of the rare glimpses inside the Pantheon’s celebrity, Amaterasu enraptures her audience with an otherworldly performance. Gillen’s narration for Laura is as hypnotic as Amaterasu’s stage presence. The script could have said, “Amaterasu’s performance puts her contemporaries to shame”, but Gillen’s strength is finding a unique angle to describe something and he does so here. It’s impressive and memorable. 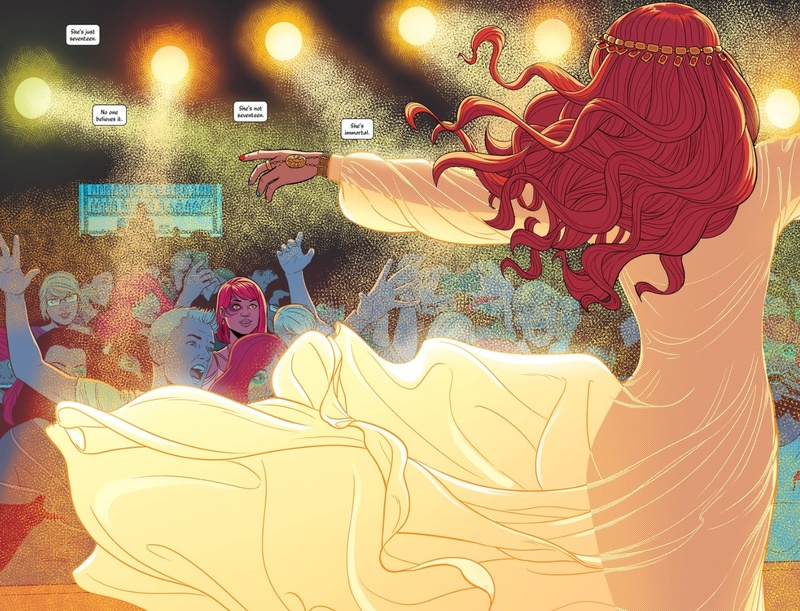 McKelvie is in sync with Gillen’s script, perfectly so, and gives us an otherworldly shot of Amaterasu’s performance; she looks like an angel that has just descended from the heavens. Am I going to have to go onto the second page of search results? Oh God. No: This is turning into homework. Gillen has a great sense of humor and he takes some inventive dives into the creative pool, almost all of which work in “The Wicked + The Divine”. It isn’t that the book needs more of this, it’s that the story around these moments just don’t click in the right places. By the time the third chapter comes, the murder mystery isn’t interesting anymore because we know so little about the possible suspects, which doesn’t change much by the end of this opening volume. The Pantheon look great, but they need a little more fleshing out. Where “The Wicked + The Divine” succeeds from beginning to end is in McKelvie’s illustrations There is a symmetry to much of his artwork that recalls the best choreographed Stanley Kubrick shots. All of the lines are sharp, clean, and mesmerizing. All of McKelvie’s young characters are impossibly beautiful and altogether appealing to the eye. There are a number of memorable sequences throughout the book, which is expected from McKelvie. Chief among them is a scene in which Laura goes to an underground (literally) show to find a god called the Morrigan. McKelvie utilizes a single panel on four succeeding pages with the artwork taking anywhere from a third to half the page. Laura’s narration is placed in the black space of the page. The effect is striking, especially in a scene where Laura and a group of music lovers head down a stairwell, the panel crosses the page horizontally with a spotlight focused on the young woman. In the same chapter we see Lucifer transform from a teenager with an edge into the lord of darkness. Using multiple images of the girl, she descends into a pit made solely of dozens upon dozens of Ananke’s shriveled visages, changing from a body consumed by flames into the more recognizable Lucifer. McKelvie’s work looks laborious but the end product is remarkable. Matthew Wilson pulls everything together with a bright warm palette that always knows when to throw a dazzling pop art punch. The textures Wilson brings to all of his panels help to build a three dimensional world in which Gillen and McKelvie’s characters can exist. 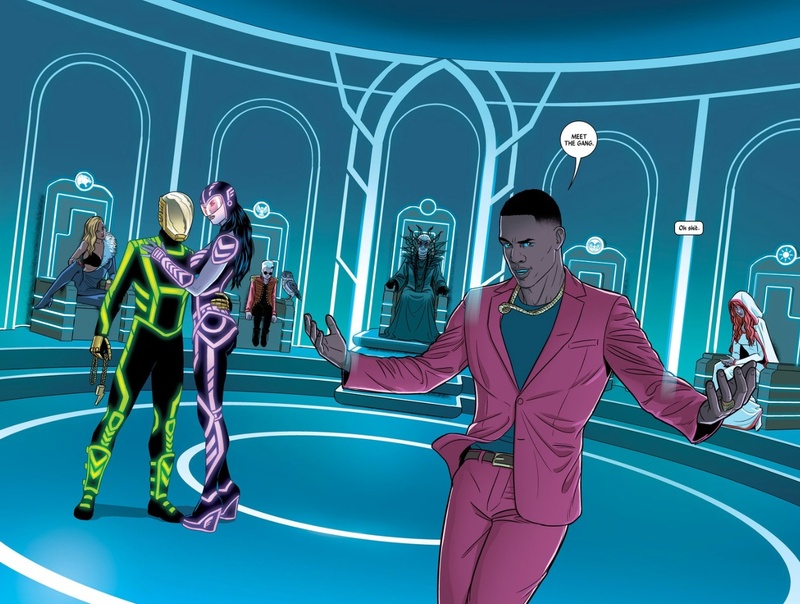 Like McKelvie, Wilson’s work is triumphant throughout “The Wicked + The Divine”. The opening two-page spread of Amaterasu from behind is exquisitely rendered by Wilson. The audience is cast in a glow that appears to simultaneously emit from the singer and the stage lights. Wilson use a coloring technique that looks as though he’s brushed the artwork with a sponge coated lightly with canary yellow paint. Amaterasu’s flowing gown is sheer, her body is faintly shaded with tangerine dots. When the book goes hyper-violent, Wilson uses mostly primary colors and a cool color separation technique that exponentially amps the shock factor of the scene. “The Wicked + The Divine, Vol. 01: The Faust Act” is a lopsided effort that is beautiful to look at while being uneven to read. That said, the story and storytelling are intriguing enough to want to see where Gillen and team are taking these holy spirits next. It’s unfortunate that this opener wasn’t able to consistently hit higher heights.